A New Map of Hindoostan, from the latest authorities. 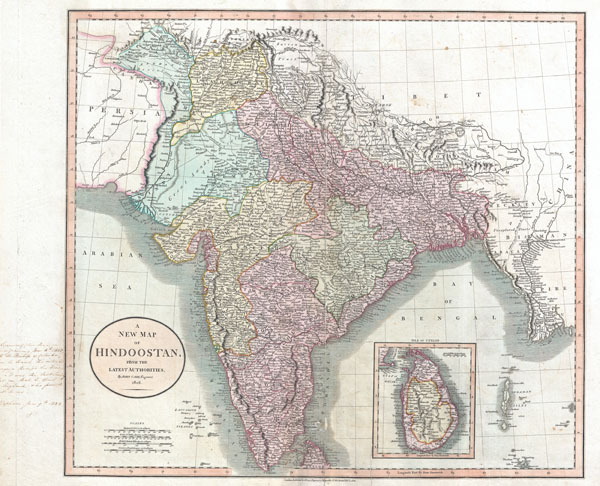 An exceptionally beautiful example of John Cary's important 1806 Map of India. Covers India in extraordinary detail from Kabul and Kashmir south to Ceylon or Sri Lanka. Extends east as far as Burma and west into Persia. Based on Rennell's late 18th century map, this map offers extraordinary detail through, noting the sites of numerous villages and cities as well as important river ways, religious sites and trade routes . An inset in the lower right quadrant details the Island of Ceylon or Sri Lanka. Examined this map on Sunday Evening June 8th, 1823, with the Bishop of Calcutta, when he traced his intended voyages through his Diocese. It was the last Sunday but one that he spent in England and his farewell gift to us. -Stephanie, June 9th, 1823. The 'Bishop of Calcutta' in question is Reginald Herber. Herber was one of the most popular Christian religious figures in India and worked indefatigably to promote Christianity in south Asia. Today there is a university in his honor, the Bishop Herber College, in Tiruchirappalli, Tamilnadu, India. The this snippet of hand written text adds significant context and importance to this already rare map. All in all, one of the most interesting and attractive atlas maps of India to appear in first years of the 19th century. Prepared in 1806 by John Cary for issue in his magnificent 1808 New Universal Atlas. Very good condition. Professionally restored centerfold. Minor closed and professionally repaired tear to right of centerfold extending about 1 inch into map. Pen text to left of map in margin - see description. Rumsey 1657.045. Phillips (Atlases) 714. The Map Collector, No. 43, p. 40-47. National Maritime Museum, Catalog, v. 3, no. 311.